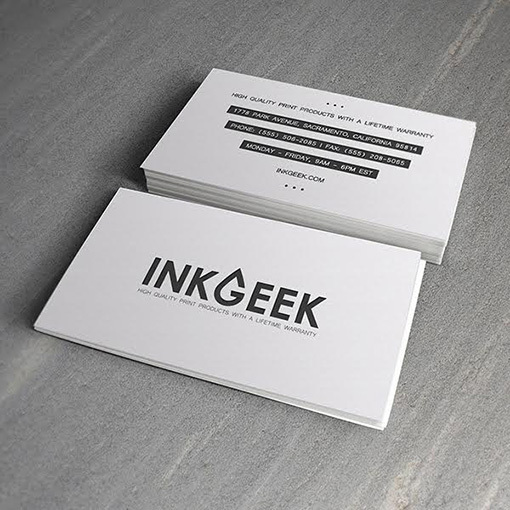 These business cards feature a minimal layout with a neutral color palette printed in CMYK ink. The thick cardstock adds a touch of elegance to the black and white design. The front panel features the brand's logo, which stretches the letter "G" to look like a drop of ink as a reminder of the printing company's name, InkGeek. The back panel places black bars behind white text to reverse the color scheme and create visual interest. Text is arranged so that the longest line is on the top and the shortest at the bottom, creating visual hierarchy.